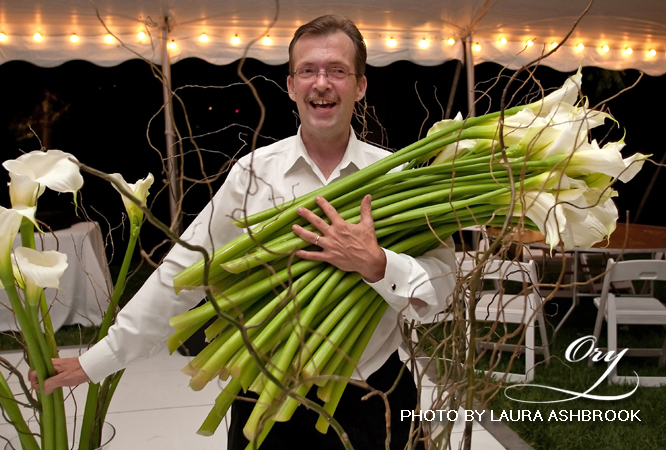 Ory Webster began from the start, training as an Event Floral Designer with Andrea Stieff, who produced the flowers for the movie "Runaway Bride." Ory's destiny, however, was to originate Ory Custom Florals at The Belvedere Hotel in Baltimore - expand his reach to the Washington/Maryland suburbs and ultimately settle his studio and production facility on Historic Main Street, in New Market, Maryland. Whether it's for a single fresh flower bouquet - or for "Barbie Doll's 50th Birthday Celebration," (we were very proud to have been selected for that event) Ory's philosophy, and that of his Team, is to fulfill the potential of the order for the customer. That includes more than eighteen hundred Weddings. And, if a Client can't get to Ory, he or a Member of His Team will meet that Client at their Venue or by phone. Ory Webster is a warm, creative, diverse floral designer. His goal, and the goal of his Team - is to give YOU what you love for yourself. A SPECIAL NOTE: This site is dedicated to Vickie Abrutyn, whose standards for quality and professionalism in the event industry are the highest.